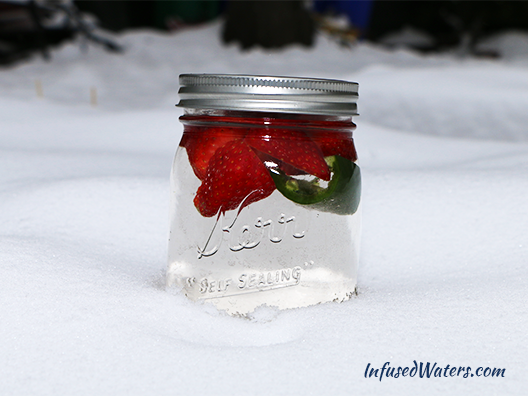 Shake away those winter shivers with an infused water that heats you up from the inside out! Jalapeño peppers bring the heat while strawberries keep the water sweet. It’s a delicious combination that is easy to modify to a comfortable level of spiciness. Recipe for a 32 oz Ball jar : 3 organic strawberries + 1/4 to 1/2 of a jalapeño pepper. Cut the tops off of the strawberries and slice them into two for maximum surface area. Use a plastic glove or piece of plastic wrap over your thumb to de-seed the pepper. Fill with cold water and infuse in your refrigerator for 3-12 hours. Enjoy cold. A note about spiciness: 1/2 of a jalapeño pepper will produce a spicy water! If you typically eat spicy foods, you’ll have no problem with the flavor of 1/2 of an infused jalapeño pepper. On the other hand, 1/4 of a pepper produces a very faint spiciness…almost too little to taste. If you have sensitive tastebuds, use 1/4 pepper. Also, the longer you infuse the water, the spicier it will become. Luckily, the strawberries’ sweetness always helps to cut the flavor. Did you know that jalapeño peppers only have 4 calories per pepper? They are are also rich in vitamin C, with almost 17 milligrams in a small pepper. Plus, the capsaicin in jalapeño peppers acts as an anti-inflammatory agent AND is recommended for weight loss and stubborn belly fat. Win! Hi Amy, I’m a teen who has decided to increase water intake and cut out white sugars, your blog has given me so many great recipes and ideas, I learned about peeling the rinds off citrus etc. I even bought an infusing water bottle for school! I hope to read many more articles in the future… You’re awesome!! Luke, you’re awesome! Thank you for taking the time to write such a nice comment. I’m glad you are enjoying infused waters and the blog. I try to update it as much as I can, but if you have any questions, feel free to post a comment. That’s really cool you bought a water bottle to take to school with you. Have a great day! I am glad I found your site. You have a lot of good recipes and I can’t wait to try them all. I wanted to say that I really like your visual on this post especially. After reading some questions from others, it might be a useful format to show the ingredients like you did on this one. Also, does this work on any volume of water or are your recipes defaulted for 32 ounces? Hi, Tyler. Thanks for your kind words! I totally agree with you that it helps to show the ingredients before they go in and I try to photograph them if I can find the time. About the ounces of water used, yes, I specify the size of the container I use for each recipe. The great thing about infused waters, however, is that you can really play around with different amounts of fruit and water. Unless you are using a very spicy pepper or a strongly flavored herb, infused waters are hard to mess up if you have an idea of the general ingredient combination. Hope that helps! Amy, I discovered your website just a few days after my doctor restricted my caffeine and sugars. I was recently diagnosed with an autoimmune disease and, naturally, I have started looking for as many healthy, natural ways to treat the inflammatory condition. I have never been a big fan of water unless it is ice cold. Living in MS, that presents a problem on the go like I try to be. Your recipes look so enticing and I can’t wait to try them all! I have one question. Do I need to cover my water with the top of the jar while it infuses or leave it open? This may seem like a stupid question but, as I said before, I am completely new to the healthy things around me. I just want to get as much of a benefit from the recipes. You are a blessing to me at this time of my life. You showed me a wonderful way to increase my water intake with beautiful, healthy fruits and herbs. Good bless you for sharing! Hello, Jennifer, and congratulations on your new healthy journey! Sometimes health crises can be blessings in disguise. Your question is not silly at all, by the way. I typically cover my infused waters while the infuse in the fridge. There is no real benefit to the ingredients reacting with air, plus fridges can be messy and I don’t want a piece of parsley or food fragment falling into my water as it infuses. I hope that answers your question. Thanks so much for the compliment and welcome to the site! I am training for a half marathon and I want to lose a few more pounds in the process. I recently had a pitcher of cucumber infused water and I loved every drop. I have just came from the store with strawberries and I just picked fresh jalapeños from the garden. I look forward to this recipe. Hi, Andy. Great to hear! Cucumber water was my “gateway water,” too. Keeping hydrated will definitely help you drop the pounds and prepare you for the half marathon. Hi Amy, my name is Shawn Merrill and I love your recipes. 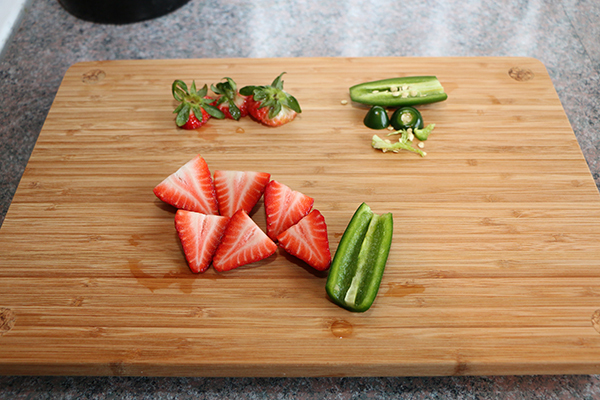 I was wondering on the strawberry jalapeno recipe if you can use jalapeno slices in place of the 1/4 or 1/2 of the fruit. You can add more jalapeno, but your infused water will be very spicy! I urge you to experiment, though. If your infused water is too spicy, you can always dilute it with water. Question, I have just started infusing and my first outing has been with strawberries and I love it. I used a whole batch of strawberries and have been adding new water for about 3 days. How long can I keep using the same strawberries, when should I throw them out and start anew? 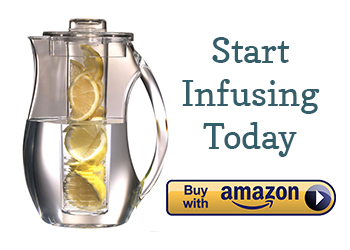 What are the advantages of using an infuser bottle vs a plain glass water bottle. I am very new to this idea. As a matter of fact I filled my water container with cold water and added leftover limes which I had sliced for dinner and infused overnight. As I sit here reading all of these great post I am still hesitant to try the water… how silly of me, its just watrr and lime! I’m just not a water drinker, but I have to make some changes as I am trying to quit smoking, loss weight and lower my blood pressure. I will be 50 in 10 weeks and would like to look and feel better than I have in years.. This recipe said to let it infuse for 3-12 hours, but over in the frequently asked questions section, it said to remove tge fruit after 4 hours. Should I remove it after 4 hr, but continue to let it infuse? I’m very excited to try your recipes! Especially the strawberry and jalapeño one. Great web site idea! & thanks for the info on the organic vs. regular supermarket fruits and vegetables. It makes perfect sense, I will switch to organic and if not possible I will remove the rinds on my citrus fruits to avoid pesticides, etc. I just came across your blog. I have been trying to quit drinking soda. So far so good in 2016. The biggest difficulty is finding recipes without citrus. I am allergic to citrus. I’m going to try the strawberry jalapeno today.